After a week of preparation, although some players did their duties for the national teams, Jürgen Klopp began his Premier League career with a point at Tottenham. Liverpool showed only rudiments of Klopp’s preferred style of football, trying to emulate the high energy gegenpressing which was synonymous with the Klopp era at Borussia Dortmund. With the likes of Daniel Sturridge and Christian Benteke being injured, Klopp decided to field Divick Origi up-front, while Emre Can and Lucas Leiva played in the middle of the park. Intriguingly, James Milner spent quite some time on the right side, but fluidly changed positions throughout the game. Using the usual telephone numbers, the Reds played a 4-2-3-1/4-3-2-1 hybrid, as both Philippe Coutinho and Adam Lallana are not genuine wingers, but rather linking players in the half-spaces. Therefore, Milner and also Can moved to the outside and supported the respective full-back. Meanwhile, Mauricio Pochettino decided to stick with the customary 4-2-3-1 shape, with Mousa Dembélé and the 19-year-old Dele Alli as number 6s. First of all, Liverpool’s pressing structure came straight out of Klopp’s playbook. The Reds usually used a 4-3-3, when Tottenham were building up. 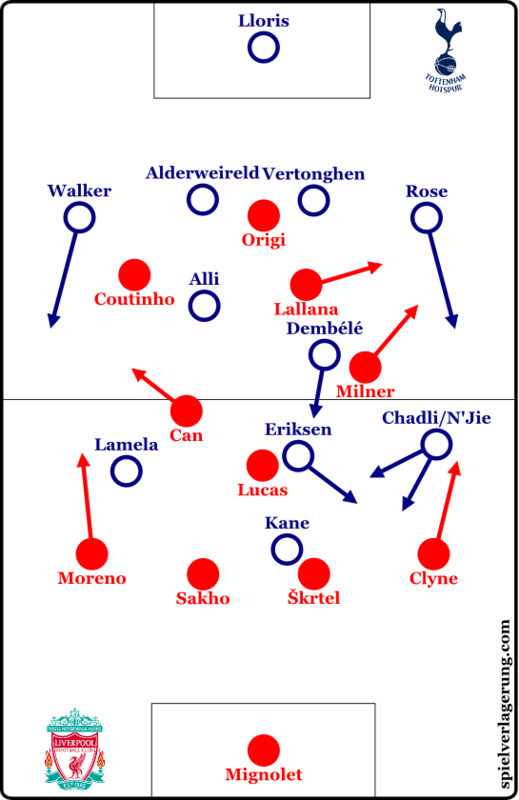 Coutinho or Lallana moved situationally towards the opposing full-back, while the ball-far winger/number 10 blocked the central zones to stop both Tottenham centre midfielders from receiving a pass. Alternatively, the ball-far winger/number 10 moved back to the second line, while the former midfield line of three pushed towards the ball. Overall, Klopp was able to implement a rather compact, intense, and ball-orientated pressing. During the first phase of the game, Tottenham struggled to play through middle, as Dortmund…um…Liverpool led them to the wings and blocked passing lanes afterwards, so that there were no open men in the half-space near the ball. Moreover, Liverpool’s gegenpressing structure worked quite well. The shown intensity after turnovers and desire to win the ball back coerced Tottenham into playing passes quickly without having the chance to build up attacking plays in a seemly way. Hence Liverpool were able to avoid opposing counter attacks, while keeping the ball in higher zones. However, despite showing promising glimpses in the early stages, Liverpool only created goal-scoring opportunities after set-pieces. For instance, Origi flicked Can’s header onto the woodwork with Hugo Lloris beaten in the ninth minute. Pochettino’s side weathered the storm and had chances to go ahead after 25 minutes, when Simon Mignolet denied Harry Kane and Clinton N’Jie, who had been sent on for the injured Nacer Chadli, in tremendous fashion. When building up, Liverpool primarily used the deeper half-spaces to expedite the attacks. Normally, the centre-backs tried to play the ball to Lucas, when the Brazilian stood behind Kane and Christian Eriksen. Moreover, Milner and Can supported Lucas as well as the full-backs, when the ball moved to the outside. 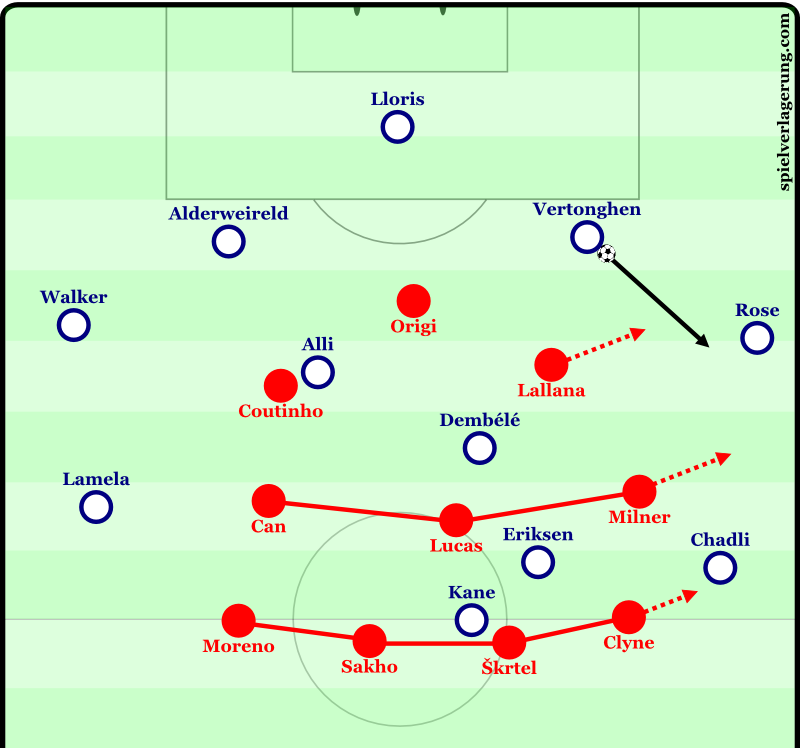 Consequently, Liverpool provided connections, because the midfielders permanently moved diagonally and vertically, so that the Reds usually had three men at each wing. 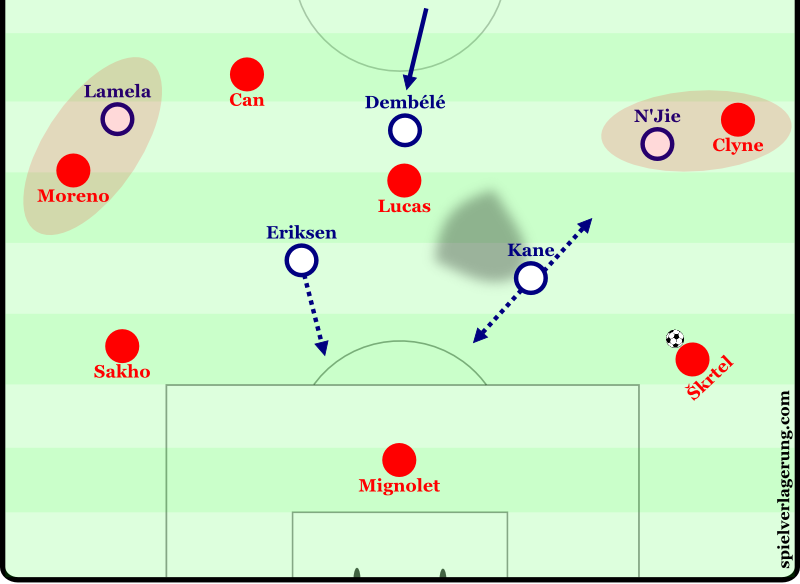 Later, both centre-backs stood wider and had problems to find open lanes, while at times Kane and Eriksen moved as a wedge in between Mamadou Sakho and Martin Škrtel. Yet, Tottenham initially struggled to figure the appropriate pressing patterns out. They simply did not know the required zones and opponents to cover. Thus Liverpool could play quick passes through wings and half-spaces without being under pressure. Particularly Milner, who displayed his football IQ by moving intelligently off the ball, not only provided the width situationally, but also played decent passes into the number ten’s space, where Lallana and Coutinho overloaded the zone. As expected, both full-backs were also asked to get involved in attacking plays, being aggressive, advancing runs in the first half. Plus, the ball-far winger/number 10 usually behaved quite intelligently, looking for gapes between the opposing defenders to support Origi. Especially after losing the ball, the Reds therefore generated compactness around the ball up-front. Speaking of Origi, the young Belgian experienced a nightmare. Apart from a few decent lay-off passes, he just was not able to physically keep up with the opposing centre-backs. Most of the balls he received were eventually lost balls. Only Liverpool’s intense gegenpressing could mask the non-existent of a reliable centre-forward. Immediately after turnovers, Liverpool mostly had four players near the ball to attack the carrier. As already mentioned, Liverpool, however, were not able to maintain the level of intensity after half an hour. As a consequence, the vertical compactness got lost after 30 minutes. Plus, some players had constant problems to cover the necessary zones or to maintain the chain mechanism in midfield. On the other side, Alli and Dembélé, all in all a comfortable pairing in the middle of the park, looked more and more resistant against Liverpool’s gegenpressing, while both full-backs also stayed deeper during build-up play to bring Milner or Can out of their midfield line. Furthermore, in some situations, Kane had the chance to get into one-on-ones with Škrtel, who looked unsurprisingly stiff. Despite seeing more of the ball during phases of the game, Liverpool easily allowed Tottenham a couple of shots. After the interval, the match looked even-steven, though, with neither coach having a dazzling idea. If the peak of his spell at Borussia Dortmund is a blueprint, the German manager could have the tools to improve the defensive and offensive mechanism of his team. His pressing and gegenpressing approach could suit Liverpool’s players and could become a problem for many Premier League side. On the downside, the Reds showed a lack of stamina to play high-energy football for the full 90 minutes.